The reset options now include a simple Source Selection and Speaker set selection layout. very similar to some existing controllers. The new TMC-1v5-win/mac program now includes a preset page allowing up to 6 keyboard setups to be saved, updated and loaded easily. 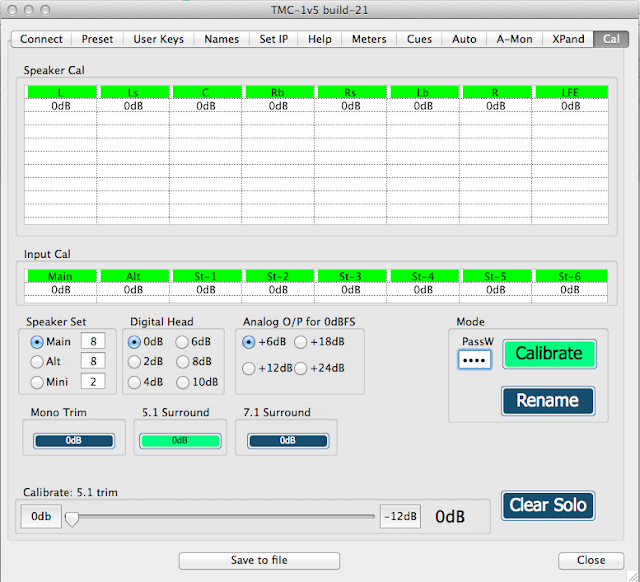 The Preset page allows a single click to reconfigure the TMC-1 with a saved setup and single click saving of the current TMC-1 setup. 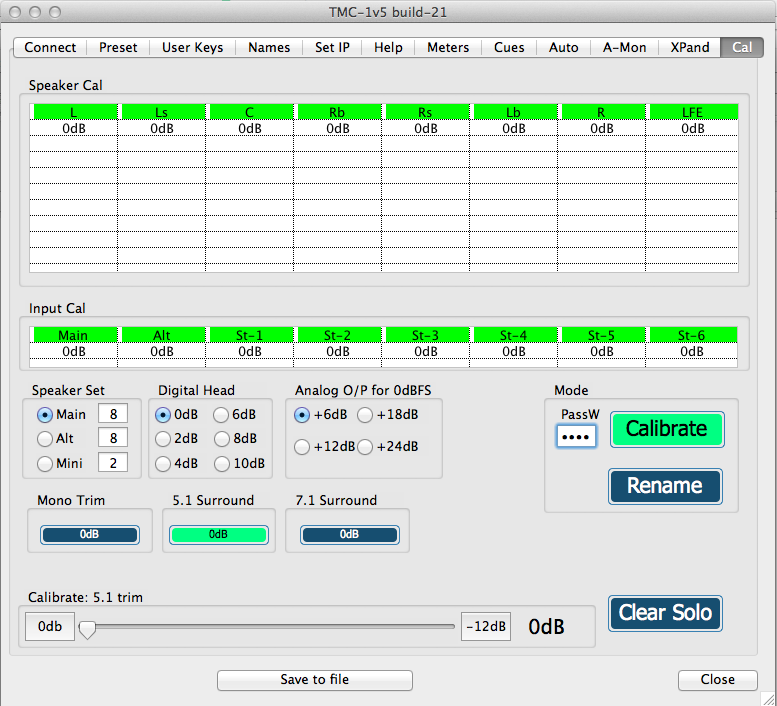 The calibration tab makes it easier to calibrate the TMC-1 Input and output levels, the headroom and Analog level settings for the TMC-1-Penta are also included. 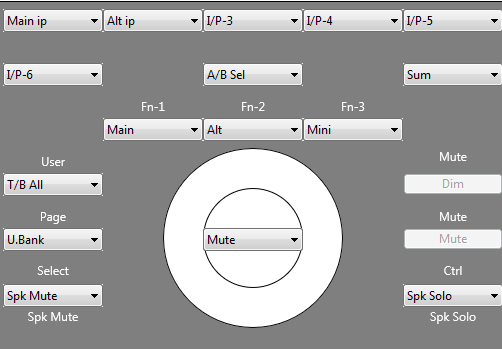 Included on the Cal page are the Mono, 5.1 surround and 7.1 surround trims (5.1 Surround tim is selected in the image). The surround trims are used when the room is setup for one format and then used to listen to a source of a different standard. For example if you calibrate a room for 7.1 and then playback in 5.1 with Ls and Rs sent to Lb and Rb you will need to attenuate the surround signals. The Rename Key also allows the names to be changed from this tab. The password is required to access the gain calibration and is as normal '1984' (Big Brother is Watching). [T/B All(x)] user key, the TMC-1 allows you to define two separate talkback zones accessed from the [T/B1(x)] or [T/B2(x)] keys, however this requires that the zones be configured. The [T/B All] key is simple and direct, talkback is enabled to all cue send outputs simultaneously. The (x) suffix refers to the eXternal or producers talkback enable. 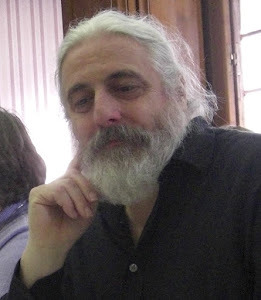 [DftFmt] user key has been removed and replaced by three Advanced Menu's to define the default format settings for the Main, Alt and Mini speaker sets. Added for the TMC-1-AMon and TMC-1-Penta, This screen displays the Left and Right channels with the SLS and H/P cue sends. This screen is selected whenever stereo output format is selected or by the TMC-1-AMon [Meter Cues] user key. To reduce the number of user setup's some have moved to the advanced setup. 2.1 and LCRS have been added to the format selections. 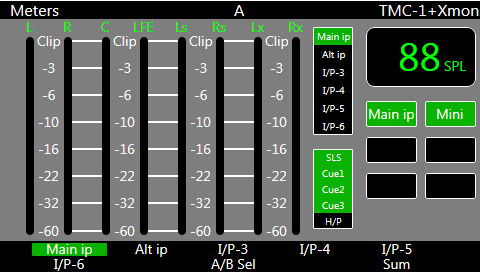 The [LCRS] allows you to set a surround attenuation for mono surround.